Are you working towards the goal of being debt-free? Are you a Dave Ramsey baby steps fan? You’ll love this humorous and heartfelt look at why you might choose to keep driving that old car, eat rice and beans, and more! It all began nearly twenty years ago for us, when we were mentored by a sweet older couple who were affiliated with a program called Christian Financial Concepts. We learned to love Larry Burkett and his challenging but life-changing books. From there, we developed a steady appetite for books and resources by Crown Financial Ministries and Howard Dayton. Dayton’s book “Your Money Map” is one we’ve recommended to young couples time and time again. Then we discovered Dave Ramsey, Total Money Makeover, and Financial Peace University. And Dave’s app — oh boy, have we loved Dave’s app — with the Dave Ramsey Show. It’s like free TV online, every day, about all things money. Here’s my humorous but heartfelt list of 13 things Dave Ramsey baby steps fans wish you knew. 1. We’ve disconnected, cancelled, and sold so much stuff that the kids think they’re next. 2. We’re not driving a hoop-dee because we’re poor. We’re driving it because it’s paid for in full and we’re saving up to pay all cash for a nicer, newer one. We plan to never have a car payment again. 3. Although it may look like it, beans and rice and rice and beans are not our favorite food. If you’d like to have us over for a more extravagant meal while we pay off debt, we’ll gladly accept! Steaks, anyone? 4. You might think our budget seems too restraining, but to us it’s our Declaration of Independence. We declare that we’re going to be independent from the chains of debt! 5. We know what it’s like to build a mammoth snowball, even in the middle of the hottest summer. Smallest to largest! We’ve got this! 6. We’re getting good at saying “no” to unnecessary things today. We’re going to be really good at saying “yes” to the most important things later. It won’t be long now! 7. We may be grown adults but we still look forward to getting our weekly allowance. 8. The BMW next door is no longer a status symbol to us. The paid off mortgage is what makes us swoon. 9. Our chosen home may not be the one the bank tells us we can afford. But — the bank won’t know what hit them when we have it paid off in ten years (instead of thirty…or never). 10. We consider how spending affects our time. People say time management is important, but seldom think about what frivolous spending costs them in time. We won’t succumb to the pressure of immediate gratification. Time is one of our most valuable possessions, and having the freedom to give our time to people and causes that matter is important to us. 11. We’ve learned to see advertising differently than most people. Advertisers are paid big money to convince us to part with our money, and that causes us major separation anxiety. Just say no. 12. Really, we know it’s not our money anyway. It’s God’s money. We’re just managing what He’s given to us to the best of our ability. 13. We’re beyond thankful that we’re able to choose to live this way, because one of our biggest motivations is to be able to live on less so we can give more. Our story isn’t finished! You can read our update here: We’re Debt Free! Our Story Of How We Paid Off Our House. 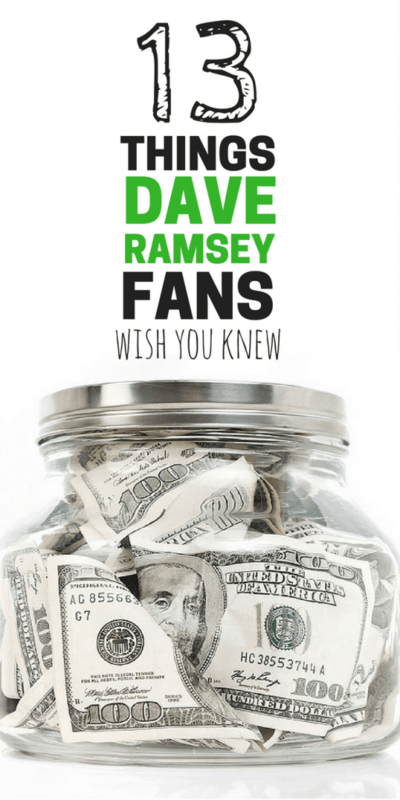 We were introduced to Dave Ramsey about 8 years old by an online friend. Let’s just say, our lives have never been the same since. At the time, we always spend absolutely everything my husband brought home from work. We went from that to being able to save a little each month while making the exact same income. Budgeting as been a life saver! These days we drive two paid for vehicles (both 2005’s) and are debt free except our mortgage. We are also well on our way to paying that off early. How exciting for you Rosanna! You’re doing great! Thank you! It was a fun post to write! So true! I paid off my credit cards two weeks ago and it is SO FREEING! My car was paid off in January. It’s all thanks to God’s provision and the snowball method. It took me a year and 9 months but I paid off over $20,000 in debt. Now I need to tackle my student loans! It was worth the missed events and I NEVER miss having a car payment :). I love that you mentioned that your budget is a declaration of financial freedom! Amen!!! LOVE this! I have been semi-following Dave, but signed up for FPU strting in October and hoping its the kick in the pants I need to GET DOWN TO BUSINESS! I am so ready to work at this and get debt free! You just signed up for FPU?! You’ll love it! You’ve got this! It’s worth it. Love this post! Love Dave Ramsey too. I am definitely going to share with my readers Thursday in our 90 ways we saved in the last 90 days post. They will love it. So many Tim’s I had how family and friends think they have lost their minds. This will definitely be encouraging. Wonderful, Tina! Be sure to send me a link to the post — I’d love to read it! *we* are the anomaly! I cannot wait until we can shout “WE’RE DEBT FREE”! My husband and I have never have debt but thats just the way we were raised …. both our families had a saying “if you can not pay upfront for what you are buying …is not worth having” and “having debt is like paying montly for a dead horse..” we got marry young at 20 thats about 11 yrs ago.. Im a stay at home mother of 4 and we live on one income…my friend always ask how we do it.. our home and 3 vehicles are full paid for.. we do it with lots of work and diciplin like our grandparents thought us.. I love reading about saving and managing money here in the US since my kids were born here I want to raise them my way with out disturbing their cultural view of things. I love this post! Which Dave Ramsey book is this from? Where do you suggest I start? Thanks in advance! We did FPU about 10 years ago. We built an emergency fund, established a budget, and paid off debt. Then, because of my husband’s relocation, I left the workforce and our income was cut in half. But because we had no debt and had already adjusted to the discipline of a budget, it was really a matter of adjusting our budget. That was 8 years ago. I love the freedom that a budget gives us. Hard to get my hubby on board with these basic, common sense principles but he’s taking baby steps. We have gone from 3 car payments to only 1, and have just this month paid off our house. We also paid off our credit cards; we keep 1 for emergencies & if we have to use it, we pay it off monthly. So we are making some progress! I would add one simple tip, which applies especially to those who love to shop for clothes. Before I buy 1 piece of clothing, i first ask myself if I LOVE it. If not, I don’t buy it. AND if I do buy it, I have to give 3 pieces of clothing away to charity. Maybe these simple tips can help someone else. I love that idea, Candy! I needed to here your principle about buying clothes. Thank you. I agree with all the above. I would also add, “No, I’m not worried about getting robbed carrying ‘all that cash.’ For 2 reasons. 1.) I believe God will protect me as I faithfully take care of what he has given me. 2.) How is anyone going to know my purse is full of envelopes filled with cash rather than a wallet filled with plastic.” We will be debt free, including the house, by December of 2019. We are sprinting to the finish and I’m playing a game with myself to see how much sooner can we pay off the house. GO GAZELLE GO!! Hello everyone i am so hopeful and excited to try all these methods. I wanna be debt free before my high schooler goes to college that would be in 3 years. Help me God! We finally finished babystep 2 on December 1st, and 3 by February 6th this year! We are on babystep 3B now. Saving to pay 100% down on our first home!!! This will be 2-3 more years, but i am so excited for it!! We have been SOOO BLESSED. This post made me laugh because it’s SO TRUE! We did our debt free scream live with Dave last year & all these points described our journey. I could probably add even more lol. Congratulations on becoming debt free! I’m brand new to all of this. One of your suggestions was starting a blog to make money. Can I ask how that works? How do you make money off of a blog? Friends have told me I should do this too but I’m so lost as to how it works. Hi Emily! You should absolutely consider it! I’ve written a post about how to start a blog here: https://likeabubblingbrook.com/best-way-start-wordpress-blog/ I hope that’s helpful to you! Let me know if you have any questions. I’d be happy to help.